The lovely people at Karma Clothing asked me to pick an item from their website to try. After making a shortlist of a few different items I finally settled on this cute skater dress. I love skater style dresses cos I think they are quite flattering on my body shape. They kinda make my legs look longer than they are, which is always a good thing when you're a tiny 5"2. The thing that drew me this dress is the contrasting sleeves, I think they're great for adding a little extra something and really make the yellow more vibrant. The dress itself is comfy and I can't wait to wear it when I'm back to uni! Karma Clothing is a great place to look if you are wanting some new clothes for September, it's really reasonably price too! Have you bought anything from Karma Clothing? 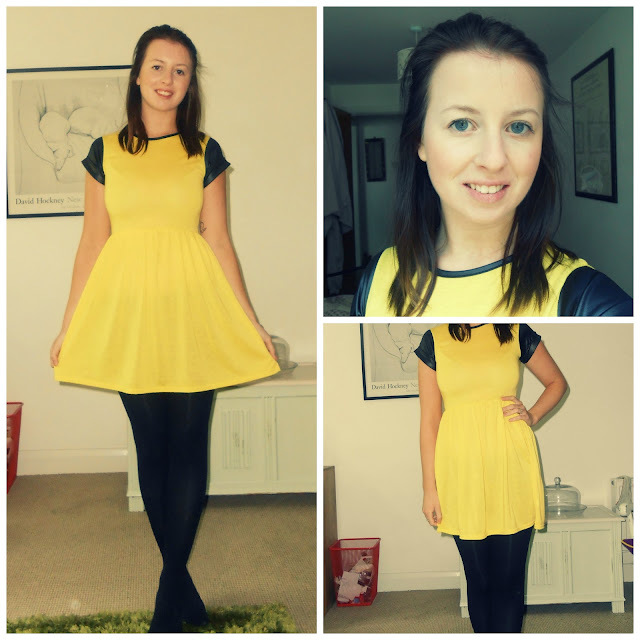 You look gorgeous in this dress and you've styled it perfectly! Bella bella bella! Stunning look! love your blog by the way - may have to return here to stalk you more!